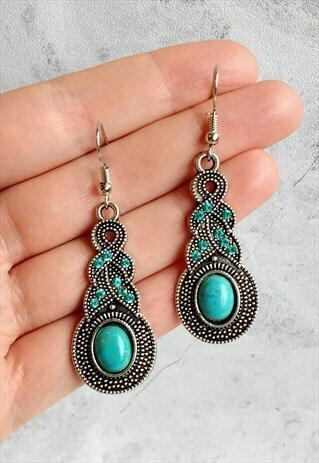 Our gorgeous drop earrings feature a unique turquoise coloured stone and stunning diamante detailing. Made from antique style silver-tone alloy, giving this pair a classic vintage feel! Brand new and gift wrapped in an organza pouch. Measures 4cm long and 1.8cm at it's widest point. Each earring weighs approx 5g. Non-returnable due to hygiene reasons unless faulty. Avoid contact with water and perfumes. Not to be worn during swimming/ bathing.